Who are you going to trust: Your doctor or the Web? Getting the best information about your health and the health of your family members and pets is important. So where do you ask for advice? 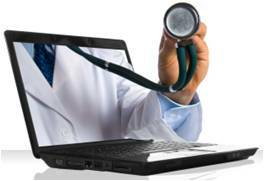 Sixty percent of consumers now turn to the Internet for medical advice online according to research conducted by the Opinion Research Corporation in the fall of 2007. What is astonishing is that 54 percent follow online advice even when they didn’t believe it! Look for the Health on the Net (HON) seal of approval which is only given to sites that have been accredited against a strict set of principles. If you don’t see this seal on the site, you can search for it. Ask your vet if he or she recommends the Web site. Who created the Web site? Are they credentialed experts? Do they keep the site current? This entry was posted on Wednesday, February 25th, 2009 at 12:51 pm and is filed under Linda's Blog. You can follow any responses to this entry through the RSS 2.0 feed. Both comments and pings are currently closed.